← More from Cwm Idwal. Yesterday I planned an early start to climb Cadair Idris. I woke drowsily. Did I have the energy to “do Cader”? The long drag up Mynydd Moel was almost vertical, I seemed to remember. The forecast was for sunshine but that is no guarantee of good light. After procrastinating for an hour or so I left the cocoon of my van and felt the cool morning air on my face. I would go for it. My viewpoint was to be high on the slopes of Mynydd Moel, overlooking the corrie lake of Llyn Cau and the cliffs of Craig Cau which tower vertically over it. The foreground would be gorgeous with heather at this time of year. By the time I arrived the sun would be at right-angles to my angle of vision, allowing my polarising filter to be most effective. I was travelling as light as I possibly could, carrying only enough food, water and spare clothing for the day and my miniscule Panasonic GX7 kit. I left the tripod in the van. Only two hours of climbing lay between me and my destination. The first half hour took me steeply up rustic stone steps through oak woodland. A mountain torrent tumbled downwards alongside the path. A few years ago I would have done this in one go, pausing only at the gate at the top of the woodland. Yesterday I needed a break every few minutes. At the gate I emerged on to moorland but it was steeper than I remembered. I forked right and crossed the stream. The mountain gradually became more prominent. I had prepared myself mentally for the agony of the final relentless three hundred meters of height gain, so it perhaps wasn’t quite as bad as I had feared. By 10 am I was at my location. Visibility was good but there was no cloud at all to diffuse the sunlight and add texture to the sky. Over the next two hours I took over thirty images. I’m still new to the GX7 and I sometimes struggled with its controls but it is definitely an improvement on the GX1. The battery lasted just three hours, as it had on its first outing. Pathetic! I found the focal length range of the kit lens (14 – 42 mm or 28 – 84 equivalent) slightly limiting. I’m not a fan of ultra-wide angles but I do like a 24mm lens. Tiny wispy clouds materialised and disappeared over a couple of minutes, but somehow never quite the right shape or in quite the right place. Oh, the joys and frustrations of being a landscape photographer! By mid-day, though, I felt confident that I would have something to show for my efforts, and it was with a sense of achievement that I reached the summit of Cadair Idris in time for my picnic lunch. The descent was laborious but uneventful. Llyn-y-Cau by Richard Wilson, painted in 1774. That evening I was attending a writing workshop at a bookshop in Machynlleth, where I casually picked up a book – The Mountains of Snowdonia in Art by Peter Bishop. 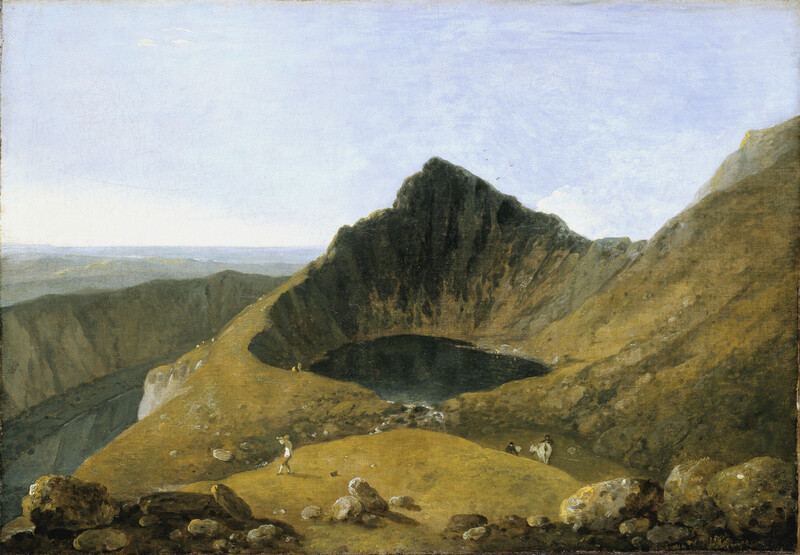 It almost fell open at the page showing the painting Llyn-y-Cau, Cadair Idris, by Richard Wilson (1774), reproduced above. To the contemporary viewer it looks astonishingly primitive, but it must have been painted close to the spot I had been earlier in the day. To my eyes the painting has been cobbled together from three elements. Firstly, the vista from close to my viewpoint; secondly, the grassy dome called Moelfryn, which the artist has placed in front of the lake, although it is actually about half a mile to the south; and thirdly, a large dose of artistic licence. In those days so few people ever visited the Welsh mountains that no-one would have been any the wiser. 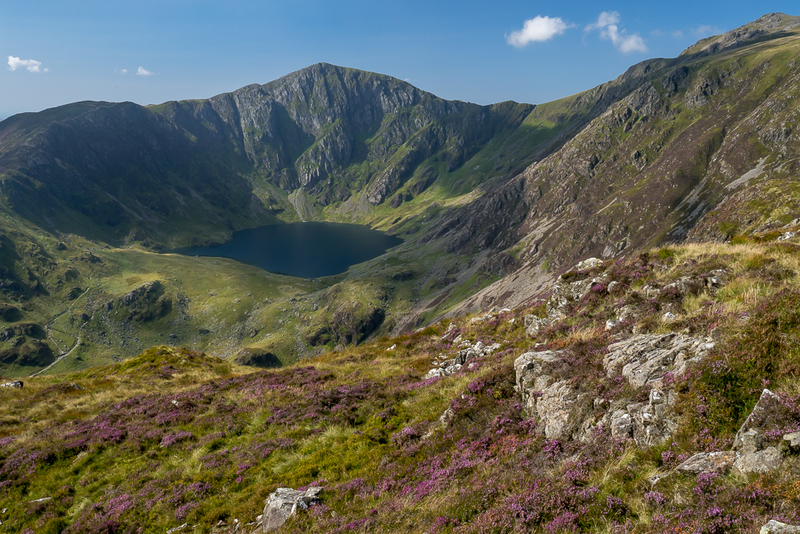 This entry was posted in Uncategorized and tagged cadair, cader, cau, craig, Cwm, idris, landscape, Llyn Cau, llyn-y-cau, Mynydd Moel, photography, richard wilson. Bookmark the permalink. Impressive IQ from the new camera Jerry, I’m looking at a lighter alternative for my travels although the battery life could be an issue! Yes, I’m quite happy with the IQ. But if you’re used to an SLR it takes quite a bit of time getting to grips with a CSC. It’s a poor experience in comparison. There are so many settings ! I’d quite happily switch about 90% of them off . It’s so easy to press a random button with a finger or your nose and you wonder “what the hell is going on here?”. And the battery life! Unbelievable. They are about £50 a hit! I wouldn’t entertain one without a viewfinder. Quite like the look of the Fuji X series, the X Pro 1 can be had for a good price with a couple of lenses, analogue controls too! I didn’t do much research before purchasing the Panasonic because I already had two m4/3 lenses. I wouldn’t necessarily have bought Panasonic again if I was starting from scratch. There does seem to be a good range of lenses available for Olympus/Panasonic though they are as expensive as full frame lenses, if not more so! I was also at the workshop at Penrallt on Tuesday, and thought I’d have a look at your blog. I’ve enjoyed looking at your posts and think your idea of expanding the purely photographic writing into a wider context is a good one. Coincidentally, while I was at Gregynog on Wednesday I noticed that in the senior common room there is a painting of the old Welsh bridge at Shrewsbury by Richard Wilson. Of course it looks nothing like the modern scene – but we wouldn’t expect it to. That’s the difference between human time and geological time – harder for the artist to fool us about rocks than about bricks and mortar! Anyway, looking forward to reading more of your blogs. Ah yes, I remember you explaining how difficult it was to delve much deeper into your personal history because of the common-ness of your name. There is sometimes said to be a parallel between photography and music but I have always felt a closer affinity with writers. I hope you continue to enjoy my blog!